More often than not, we forget the most important thing we have - Life. The ability to wake up in the morning, the ability to get up, brush our teeth, take a shower, wear our clothes, all without help. The ability to eat, to laugh, to cry, to work, to play, to live and to love. To cuddle under the blankets with the spouse on a chilly night, to have the little ones race to the door and greet you with a beaming smile as you return from work....... the list is endless. Thankfully, something comes along to shake us from our reverie, and we are reminded of how damn lucky we are. To be alive. And as long as we are alive, we know the future is bright. As we countdown to the end of September and the end of the year, let's challenge ourselves to live life to the fullest. Enjoy every moment. Take a vacation. Stop to chat with someone. Give your long lost friend a call. Smile at a stranger. 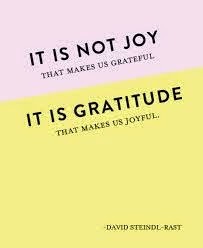 Be grateful - express appreciation for what you have, not for what you need or what you want. Never stop counting your blessings. Celebrate Life. Every day. Every hour. Every minute. Every Second. Thanks for this. I read the piece yesterday when someone shared the link, and I had to take a break to get back in shape. Indeed it's amazing what we take for granted on a daily basis.